With the recent tragic news of the missing Malaysia Air flight, I find a familiar fear creeping up. 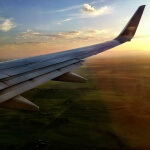 Yes, a frequent traveler such as myself struggles with how to overcome a fear of flying. I didn’t always fear flying. When I was a child I thought it was quite a fun joy ride with free snacks and a view. Perhaps too many action adventure movies and repetitive news reports have jumbled my nerves and ordinarily optimistic attitude. But then there was that one time I got caught in bad turbulence on a flight home. There was a thunderstorm at our connecting airport and lightning flashed on both sides of the plane. Anything that wasn’t buckled-in our tied down was tossed around like popcorn. I held on tight and bit my bottom lip. It’s the first time I actually felt fear while I was in the air. I even teared up a little. I had been away from home for about 12 days, and all I wanted — all I could think about — was my husband’s warm comforting hug. But the way this flight was going I thought I’d never see him again. The other passengers around me were more brave, so I blotted my tears on my sleeve. We ended up landing at a military airport to wait out the storm and after an overnight at a hotel airport, I eventually made it home. The kindness of strangers got me through it. So, how do I ever get back on a plane again after an experience like that? The type of jostling that makes a person sincerely want to get on their hands and knees and kiss the ground after landing? I did what anyone worried about a flight would do. While laying awake in bed, I picked my iPhone up off the nightstand and began playing Google like a slot machine to see what facts and articles would come up to either A) confirm my fear and make me a over-land-only traveler, or B) Prove to me that my fears are unfounded and allow me to finally rest and go to sleep. Thankfully, “B” was the winning answer. 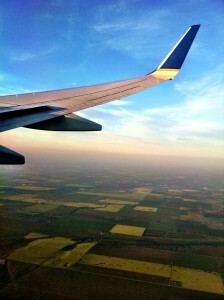 Here are some sources that I found to help overcome a fear of flying. Conditions might be annoying and uncomfortable, but the plane is not going to crash. Turbulence is an aggravating nuisance for everybody, including the crew, but it’s also, for lack of a better term, normal … the pilots aren’t worried about the wings falling off; they’re trying to keep their customers relaxed and everybody’s coffee where it belongs. Turns out, not only is turbulence normal, it’s expected. And the wings aren’t going to fall off! Joy! His whole website, AskThePilot.com, is a wealth of information about planes, flights, and everything you were ever curious about or just wanted to know for peace of mind. He even has answers to what those strange noises are below your feet in a plane as well as some credible insight on the crash of Malaysia Airlines flight 370. For now, I’ve just bookmarked Patrick’s website to go back to and read when ever I start having a total fear of flying freak out. But I did also find a program called SOAR, oddly enough at FearOfFlying.com. Here they answer many of the same questions AskThePilot.com does and they offer a dvd counseling program for severe cases of the fear of flying. Overall, the odds are definitely in favor of flying. Thanks for this! I am currently traveling around the world with a nervous flyer so this is good timing. Especially since we are currently in the same area as the missing flight. Oh, I hear ya, Rachelle, I hear ya! 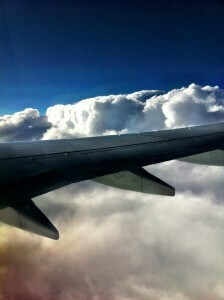 I travel a lot, yet have a (controllable) fear of flying. Controllable I say, because in fact I never experienced anything like you did. I would indeed be scared to death then! The tragedy with the Malaysia flight fired up my fears again, being in Seoul now, flying back to Singapore soon. And yes, the way you overcame your fear is the only way I know too: dive into facts and statistics. That, and just hope for the best;-). Thanks for the links in your post! Great. I know I’ll be reading that bit about turbulence to calm myself before any flight from here on out. It really is safe to fly and very rare for their to be an accident. Statistically it’s much safer than driving and I drive all the time. Rachelle, please get my free app and put it on our iPhone. It has a huge amount of helpful info, but the best this is a G-force meter that reads the turbulence during the flight and proves the plane is OK. Helps you realize the plane is NOT falling out of the sky. Thank you Capt Tom! I’ll definitely be downloading your app and taking a look at your book as well. I’ve got quite a few trips coming up (London, San Fran, and Berlin), so I’ll need more then just a cup of tea to calm my nerves. Thank you, again! I am literally TERRIFIED of flying. I actually didn’t fly for years because of it and would do crazy things like take the bus for 5 hours instead of a 45 minute cheaper flight! Since I’ve traveled so often over the past couple years I’ve calmed down a lot but this missing plane thing freaks me out. The thought of plunging to my death is what scares me… I have nightmares about nose diving and can’t imagine how horrible that would feel. Usually this is remedied with a doctor-prescribed anti-anxiety pill. I only take these for flying haha…. just pop one right before the flight, pass out, wake up in your destination! Thanks for this, I am exactly the same. Have flown many times but as I get older I’m becoming much more nervous. I’ve just had a baby and I really don’t want to pass my anxiety on to him so have been thinking of ways to brainwash myself somehow! Will check all of these out and hope for the best. Many thanks, Rachelle, for highlighting my website and my work. That said, the book was not written exclusively for fearful flyers. It was written for TRAVELERS. Ultimately it is not a book about “airplanes” or about “flying” per se, but about the whole grand theater of air travel, from safety and terrorism to airline service to airport architecture. The questions-and-answers segments are blended with essays, sidebars and memoir.